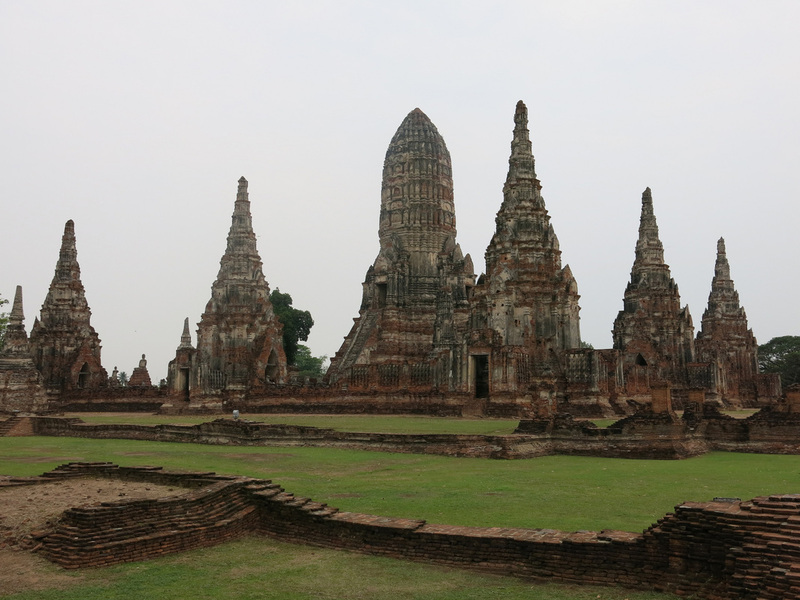 Ayutthaya is the former capital of Thailand, before Bangkok. The city originated from the combination of smaller kingdom's along the Chao Praya River. 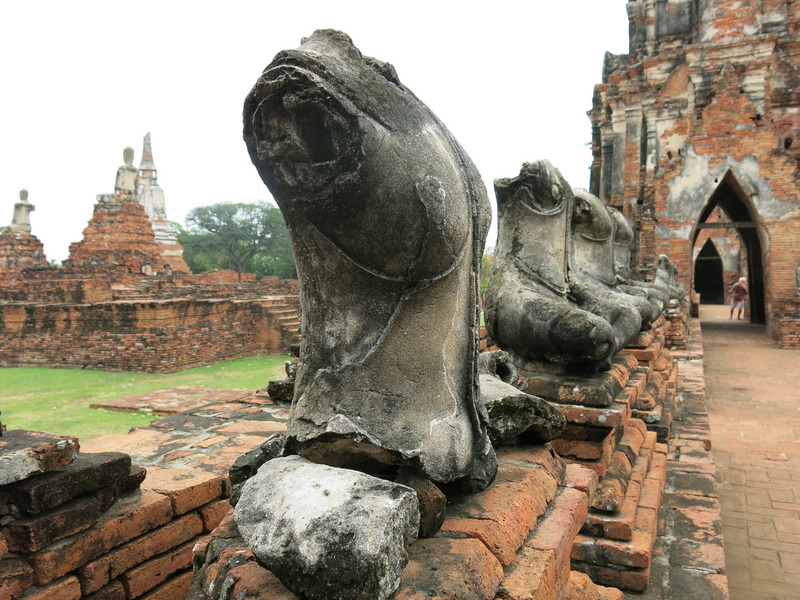 These smaller kingdoms eventually formed a large army that conquered other kingdoms, most notably Sukhothai, who's defeat consolidated Siamese power in Ayutthaya and lead to the city become the capital in 1351. 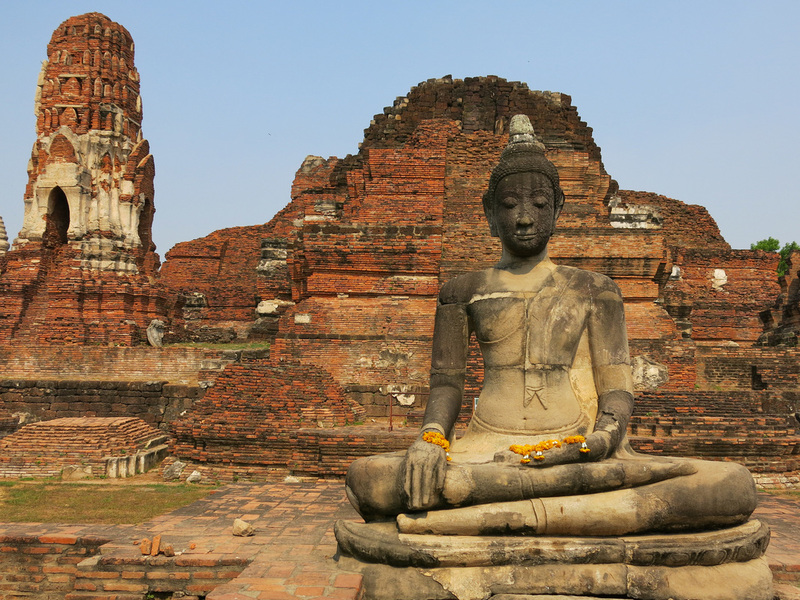 Over the next 400 years Ayutthaya prospered as the center of Siamese culture. Palaces and temples were built throughout the capital. Foreign traders and diplomats were welcomed in the Siamese courts. Unfortunately for the Siamese, the historical back and forth skirmishes with the Burmese, reached an apex in 1767 when the Burmese army overcame the Siamese forces and marched through to Ayutthaya. 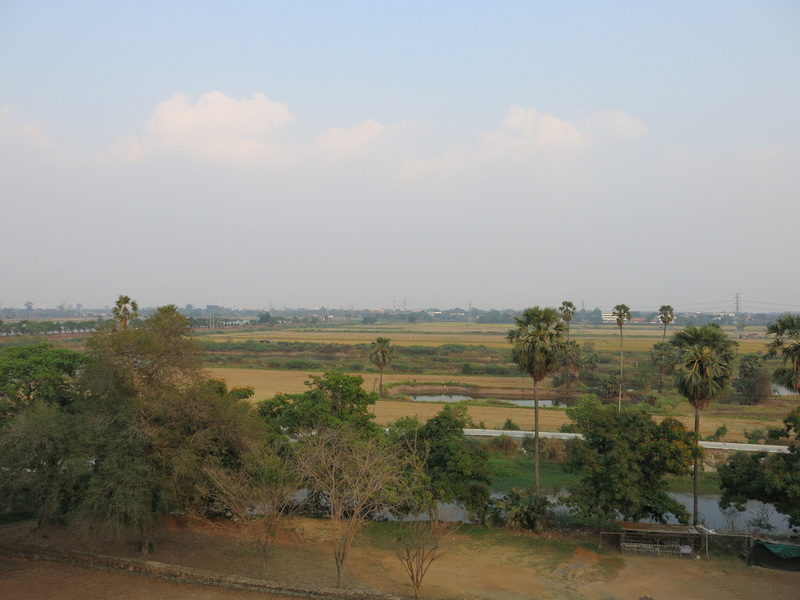 Upon reaching the Siamese capital, the Burmese burnt it to the ground. The Siamese fled south along the Chao Praya River. The Burmese stopped their pursuit when the Chinese invaded Burma and most of the army retreated to protect their own capital. Sensing an opportunity, General Taksin used the remaining Siam forces to drive out what remained of the Burmese forces. 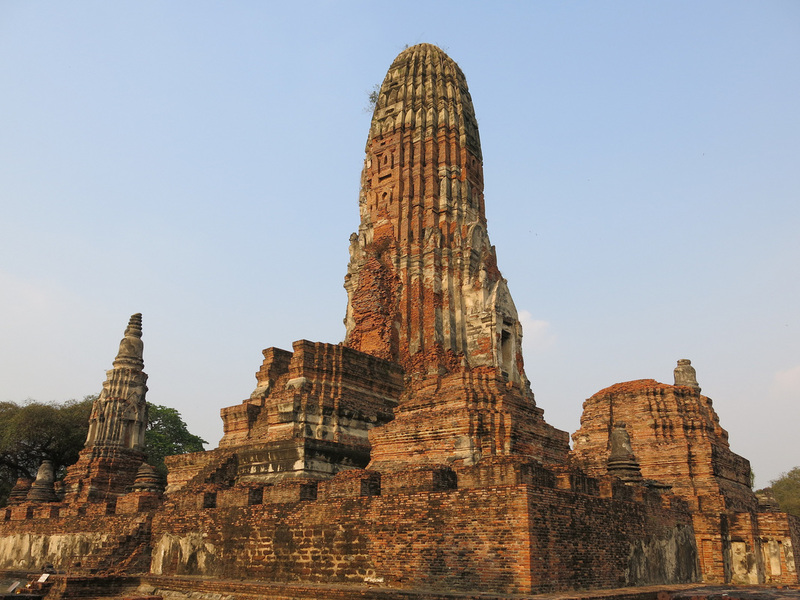 He then re-consolidated Siam, established himself as ruler, and administered the country from Thonburi - the city of Bangkok grew around Thonburi and later became the present capital of Thailand. 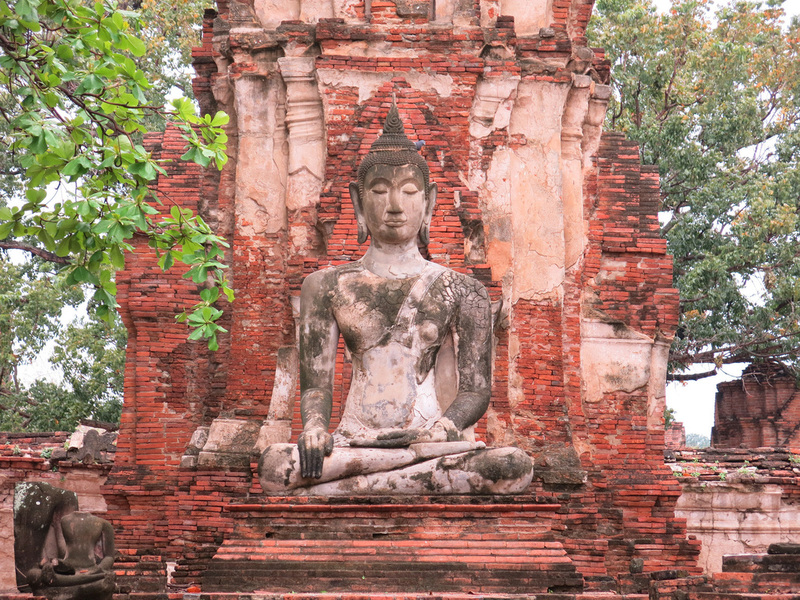 The charred ruins of Ayutthaya remain today and are a highlight of any trip to Thailand. 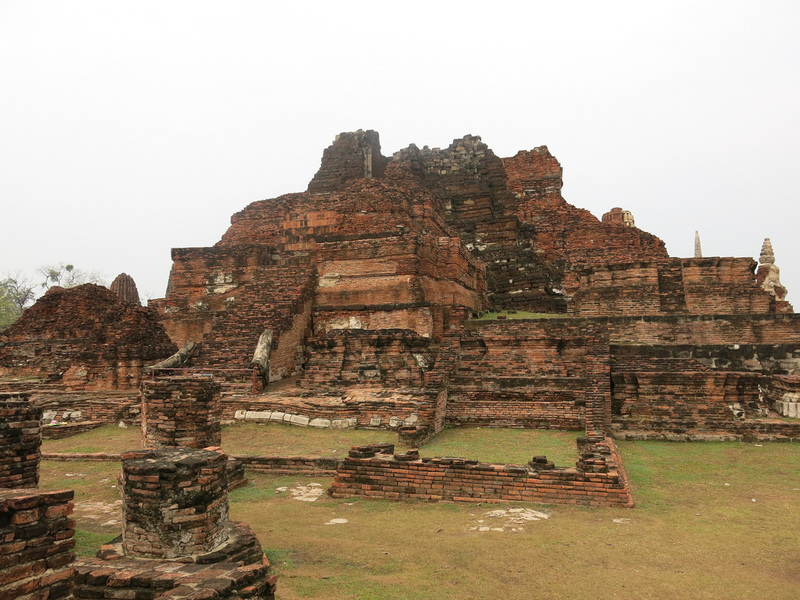 The city and ruins are easily visited with a 3/4 day trip from Bangkok via one of the minibuses that leave from Victory Circle. The minivan from Victory Monument costs 60 baht and leaves from the two o'clock position on the circle. The city's position along the Bangkok to Chiang Mai railway also makes for a convenient stop from Bangkok before catching a sleeper train to Chiang Mai. Train tickets cost 20 or 300 baht depending upon class and leave from Huang Hom. Ayutthaya train station is about a 30 minute walk to the temple area (it's location 14 on the map below) - if it's a hot afternoon you'll want to consider taking a tuk tuk. The train station has a luggage storage area and a shower room (i.e. a hose and a large bucket) to clean up after your visit and before boarding the train. There's a few restaurants on the island, however, I thought the ones across from the train station were a little better. 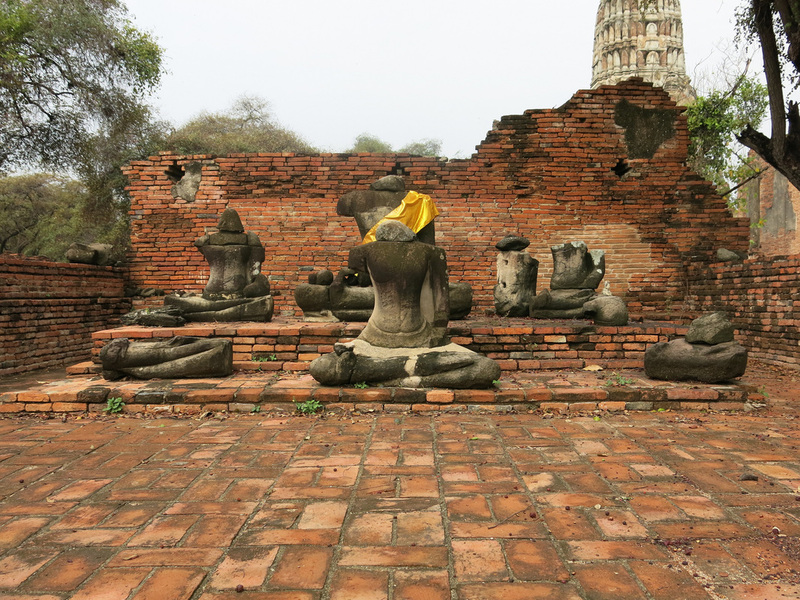 There's not much in the city to warrant a night's stay, (attractions covered in a day, limited dining) although Ayutthaya does serve as a hub to reach other destinations in north central Thailand. 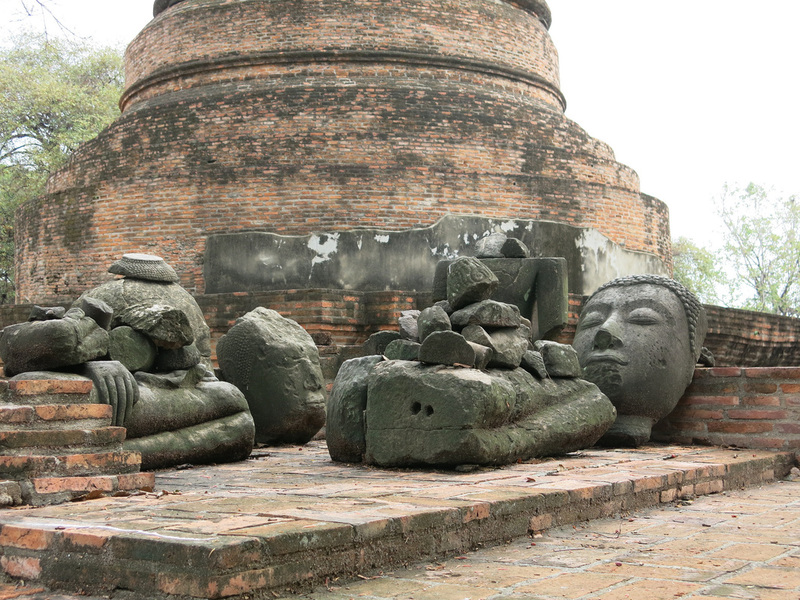 Kanchanaburi is a two hour 200 baht minivan ride away; Sukhothai is 4.5 hours and 450 baht - the minivans leave in the morning, thus its not possible to make a half day morning trip to Ayutthaya then continue on to these farther locations. 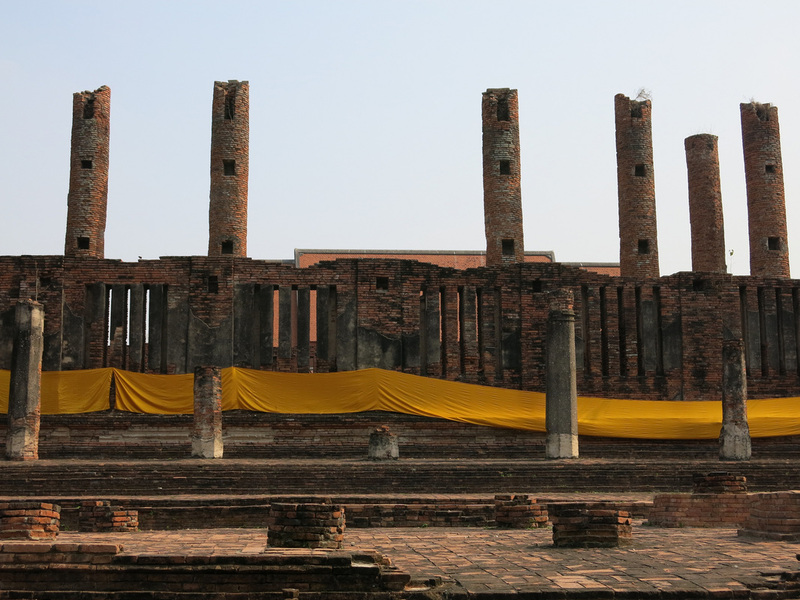 Conceptually the Ayutthaya ruins consist of two "areas" - an island and the surrounding area. The island area contains the most prominent temples which are clustered within walking distance of one another. The surrounding area has several large, individual temples scattered to far apart to walk and to far to bike, if its a warm and sunny day to far. To reach the surroundings areas its best to rent a tuk tuk for about $200 baht per hour and also arrange for the tuk tuk to return you to your accommodation or either the train or minibus stations. Before you begin exploring its best to research the temples in advance to prepare your route and minimize and backtracking. Below are recaps, suggestions, and photos of temples on and off the island. All of the on the island sites are within walking distance of one another - none more than fifteen feet apart. It's tempting to consider renting a bike, however, I think it's just as easy to walk. There's not much shade so consider bringing an umbrella for some protection. This is the closest temple to both the train station and minibus drop off area. It's also one of the most impressive sites thus making this the best spot to start your visit. It's a good benchmark for the temples that follow and has many of the features seen elsewhere. There's an entrance fee of 50 Baht - each temple has an individual charge of 50 Baht. 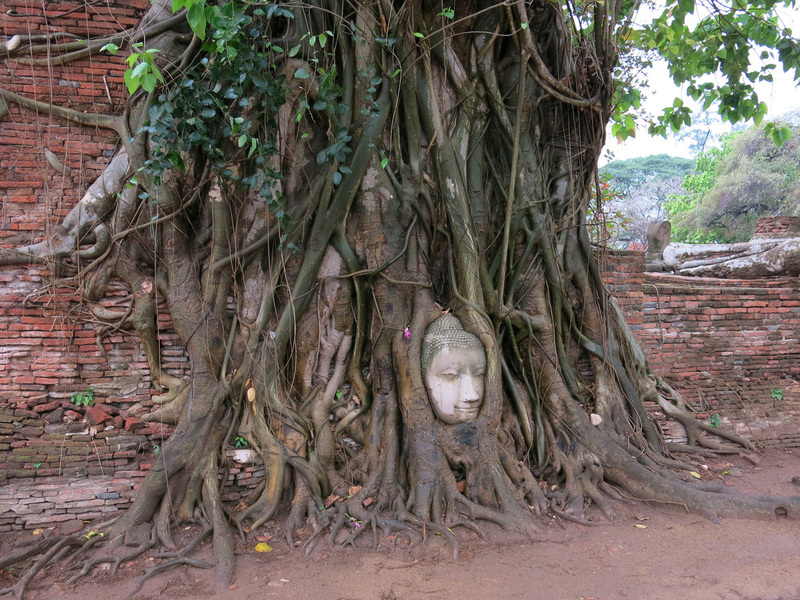 The distinguishing feature of this temple is the head in the tree roots - it's a common image seen on many Ayutthaya postcards and marketing materials. The head is easy to miss if your not looking for it. It's to the right of the entrance area in a tree away from the temple. It takes about thirty minutes to walk through this site - the remainder of the temples take about fifteen to twenty minutes. 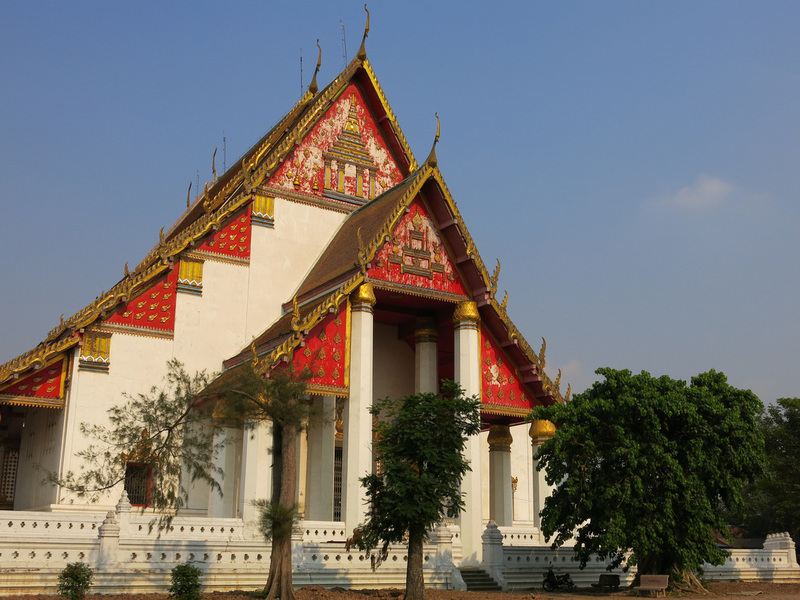 This temple is across the street from Wat Mahathat with a distinguishing feature of a large prang. Unfortunately as of February 2015 the prang is receiving quite a bit of restoration work. 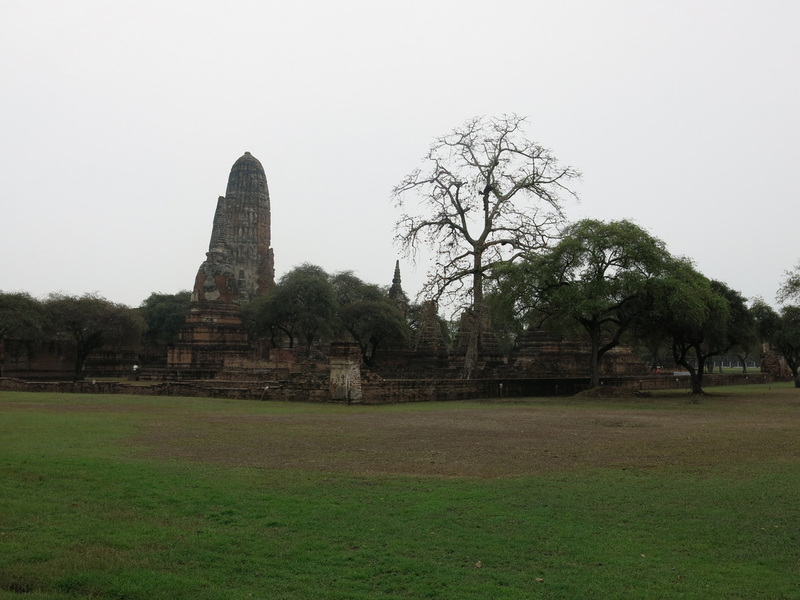 Also from the layout, even thought this temple is across from Wat Mahathat its about a fifteen minute walk. 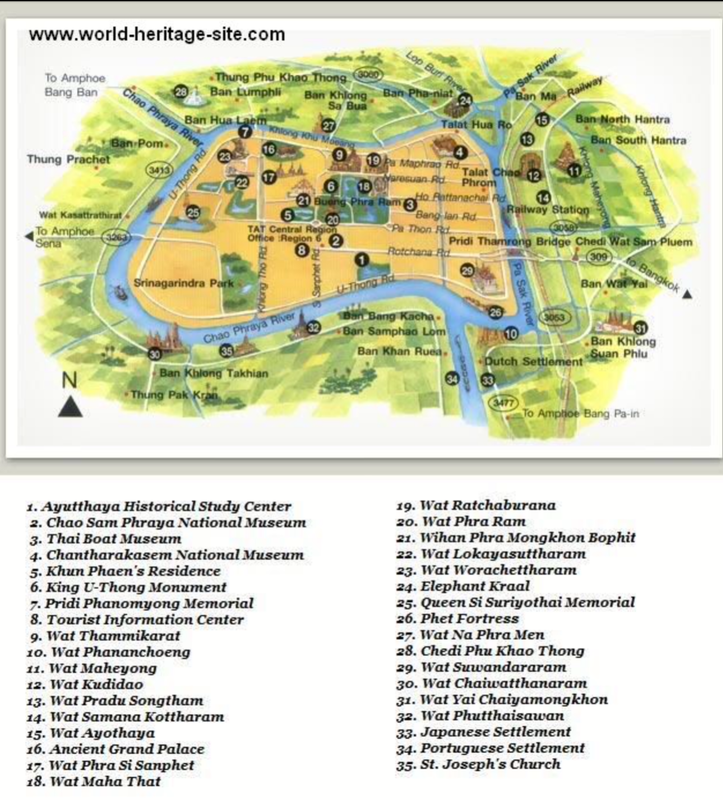 I'd skip this temple and cut through the park to Wat Phra Mongkhon Bophit. 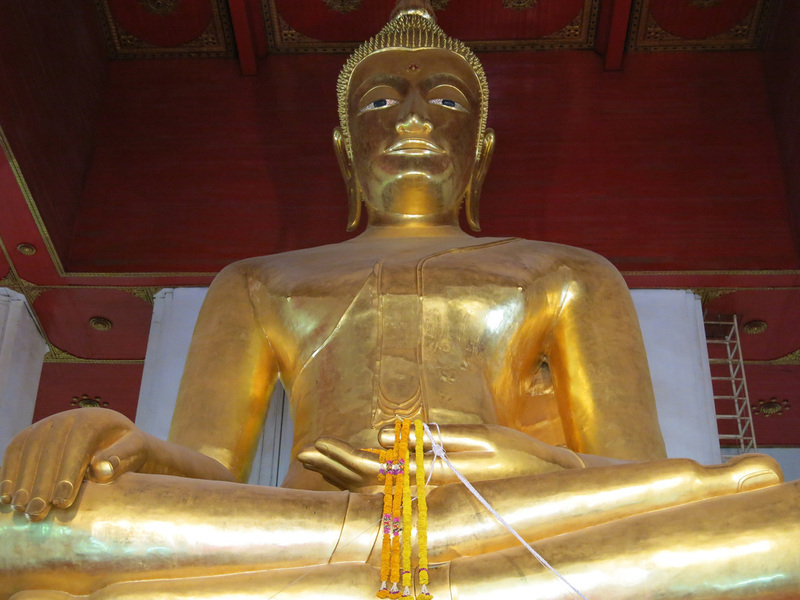 A newer building contains a giant golden buddha on the inside. There's not much else to the site beside the golden buddha, but be sure to not miss the smaller jade buddha, which is just as impressive, to the left of the entrance. No charge. This temple complex is next to Wat Phra Mongkhon Bophit. 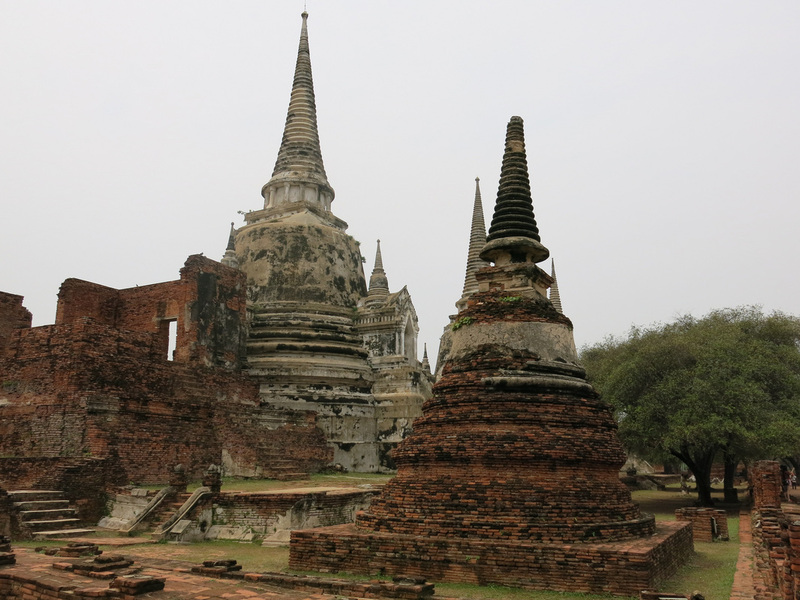 There are three large and restored chedi (Thai term for stupas) set beside one another. Since they are restored, there's a little more leeway in being able to walk over and around the ruins. The stalls outside this complex are one of the few areas were you can purchase a trinket. 50 baht. 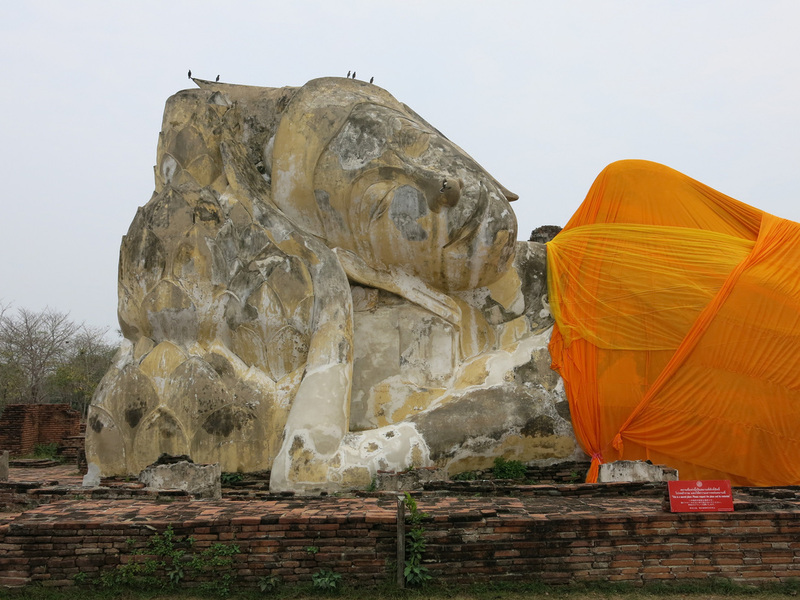 With Wat Ratchaburana undergoing restoration (and even if it isn't) this is the better location to view a large prang. 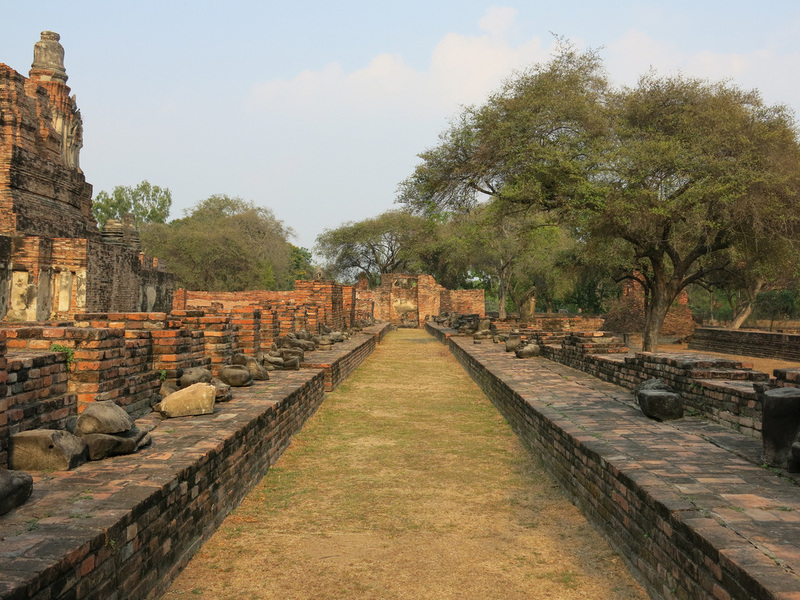 This temple area is similar to Wat Maha That with the central hall surrounded by walled pathways adorned with sitting and crumbled Buddhas. 50 baht. 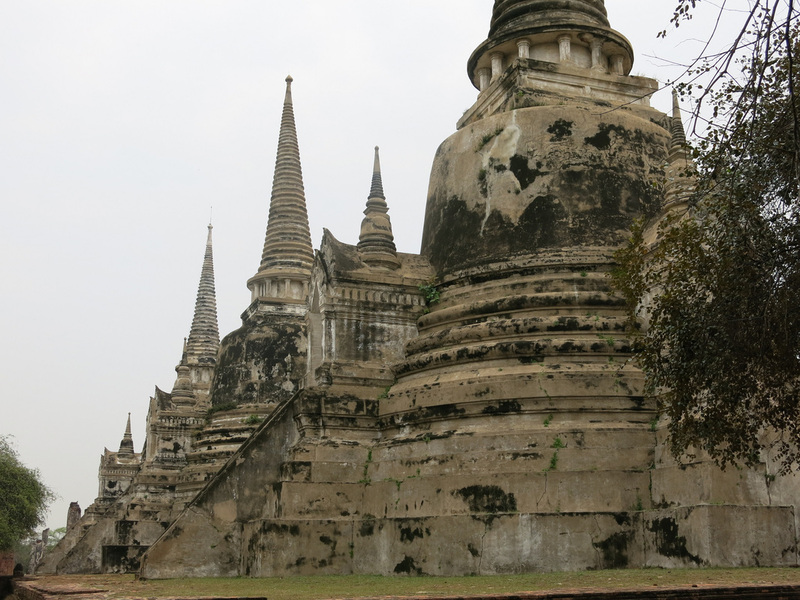 There should be tuk tuks circling the area between Wat Phra Mongkhon Bonphit and Wat Phra Ram. The going rate is 200 Baht an hour, however, on my two visits I've only been able to negotiate down to 300 Baht - not a bad deal when traveling with my parents but a bit pricier for when I was alone. Arrange for the tuk tuk to return to a hostel, minibus, or train station. 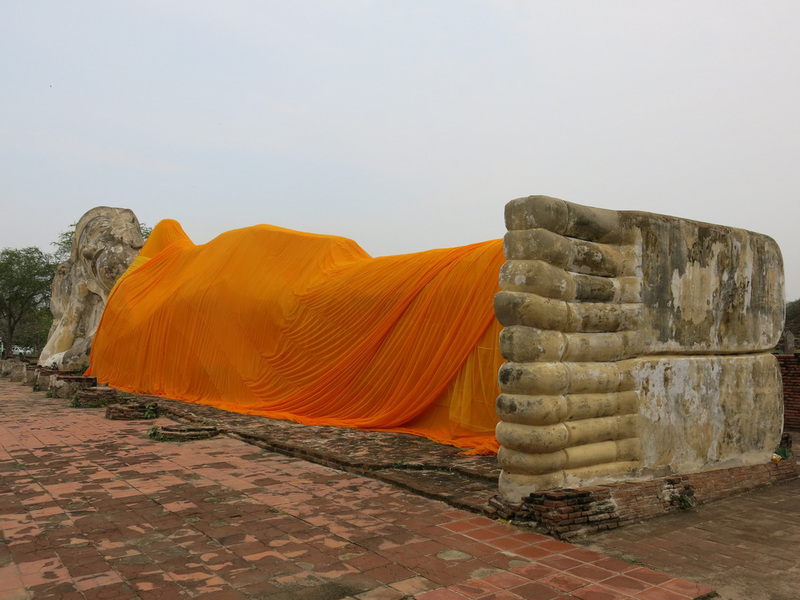 Before heading off the island have the tuk tuk swing by the reclining Buddha - Wat Lokayasuttharam. There's not much to this site other than a ten minute photo op which hopefully doesn't coincide with a tour bus arrival. This is the last place where you can find trinkets to purchase. No charge. 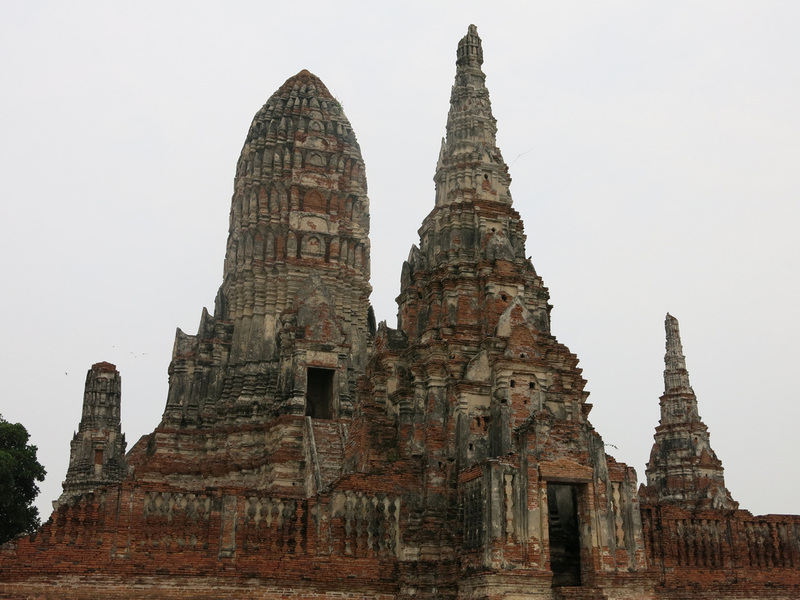 This is the largest and best preserved of the Ayutthaya sites and resembles some of the temples found at Angkor Wat. This is also the site feature on the postcards and brochures. After buzzing through some of the previous sites this one takes at least thirty minutes to walk through and appreciate whats left standing. 50 baht. 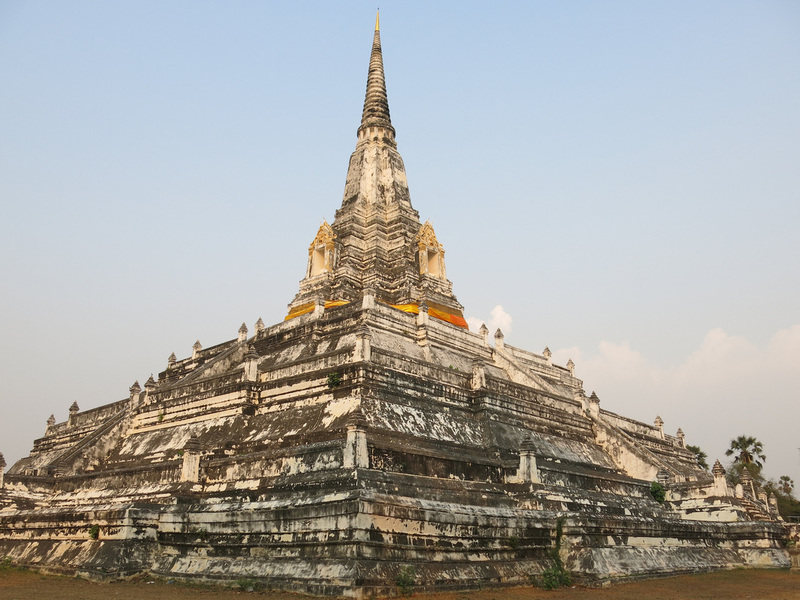 This may be the singularly most impressive site - it's a large chedi on top of a raised platform. It's a bit of a ride from Wat Chaiwattanaram - certainly more than you'd want to bicycle. The view from the top is not too spectacular although its still a fun climb up to the top. No charge. Coming from Chedi Phu Khao Thong, this temple is on the way back to the hostel and station areas - do not be fooled in thinking it's a short walk from Wat Ratchaburana as the map will lead you to believe. 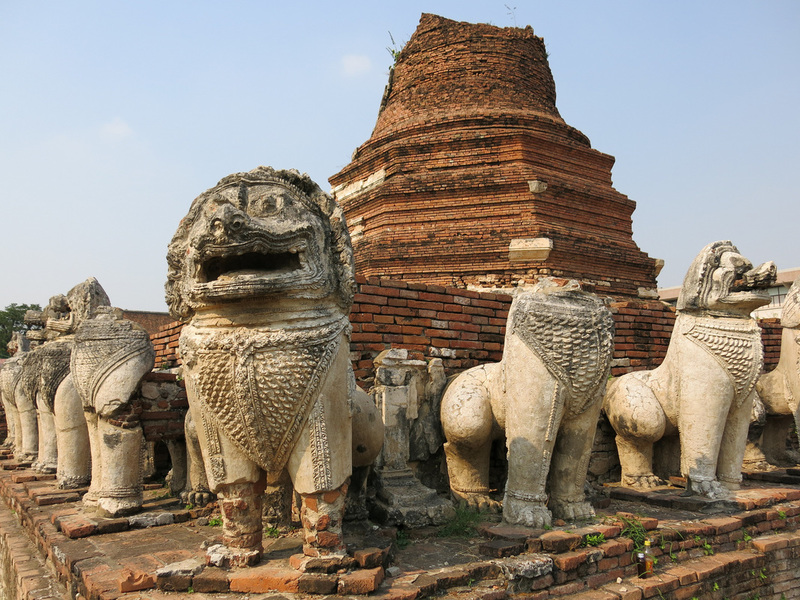 There's a chedi surrounded by lions which is a distinct feature from the other sites. There are a few Foreign Settlements located in the area reflecting the historical commerce in the area. The Dutch Settlement is the largest and there's also a Japanese and Portuguese settlement. I did not visit these site because my understanding is since these were mostly wooden structures little to nothing remained. Excavation work shows building outlines but not much else. For additional Ayuttahaya photos see FLICKR ALBUM.